As most will have guessed I have cheated here a little and posted a photo of myself in times long gone. To see a more current version you can use your mouse to display a photo taken in more recent times together with my better half. Born in England a long time ago. Educated at Dagenham County High School. Joined the British Army in 1952, served in Japan during the Korean war. 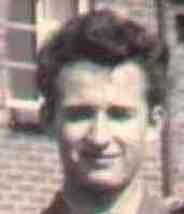 Left for New Zealand in 1958 after joining the New Zealand Army in London. Left the NZ Army, and in 1963 I travelled to Sydney, Australia in search of fame and fortune (found neither) although I did find a good career. Whilst employed by a firm called The Commonwealth Industrial Gases I commenced a career in Computing and apart from a 3 year hiatus remained in the computer industry until my retirement in 2001. I still keep myself up to date with the computer industry and maintain several computer systems from home. During my stay in Australia I became very interested in Greyhound Racing, a flash back to my nights at the Romford Greyhounds where I spent many happy evenings with my brother Brian. For about 3 years I trained a couple of greyhounds aptly named I guess, Raymond's Folly and Dunton Panther. They won several races for me and it was indeed a rather good time in my life. I am sure that on many occasions the dogs ate better than I did. Having been interested in flying for many years, but never being able to afford it, I decided that at the age of 52 I should learn to fly. I commenced training in February of 1987 and progressed through the ranks obtaining my Unrestricted Pilots Licence with Retractable Undercarriage and Night Flying Endorsements. As all good things must come to an end so did my flying, a combination of health and the sheer expense of flying forced my retirement from a first class hobby. Golf is another sport which gives me great pleasure and although I was well into my thirties before participating in the sport of golfing I still managed to achieve a handicap at the lowest of the double figures. Age and lack of playing has seen that creep out to 16 but still an enjoyable pastime.